Check out what past clients who’ve been kind enough to provide reviews have said about my services for them. 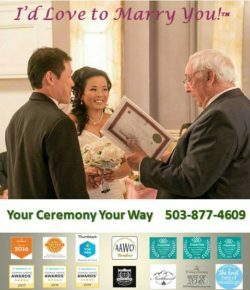 I’m a 5-star rated wedding officiant who performs ceremonies in and around the Portland/Vancouver metro area (and beyond). I specialize in religious or non-religious ceremonies and can help customize marriage vows. My objective is to provide you with a ceremony that meets all of your needs, wants, and desires. A pre-ceremony meeting is always offered, and short notice events are welcomed. I am highly reviewed on multiple online platforms where customers speak highly of my patience, passion, and professionalism. Prospective clients can book Reverend Jon Turino online or by phone. Contact me now! We cannot say enough great things about Jon!! He was EXACTLY what we were looking for in an officiant for a traditional, simple, & intimate elopement ceremony. Jon was incredibly responsive when we first reached out to him and again whenever we needed him (which was only a few times). 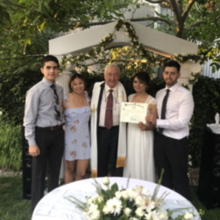 He provided us with a “blueprint” so to speak, of the ceremony (also perfect for us and also exactly what we were looking for) which we were easily able to adjust a bit to custom fit us more. Arriving 20 mins early, he effortlessly blended right in with our crazy families as if he’d been a lifelong family friend. Jon was fun, easy going and laid back, yet still traditional and extremely professional. After he’d left, everyone kept remarking how impressed with him they all were. 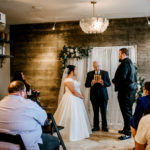 Jon is an absolute natural and we wouldn’t recommend going with anyone BUT HIM for an officiant! We can’t thank you enough Jon! We couldn’t have gotten or even asked for a better officiant nor could we be more pleased!!! You were an absolute delight as well as absolutely PERFECT from the get-go!! Grateful to have Jon as our officiant! Holly said… Jon was such a calm presence on an otherwise hectic and quick moving day, he made us all pause and reflect on what marriage is all about. I loved the wedding script he was able to put together for us too! It was an all-around wonderful experience and the ceremony ran smooth beginning to end. It was my pleasure to be of service to you and Eric. 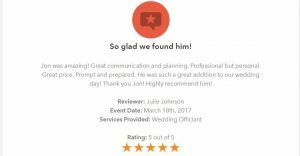 Thanks for selecting me as your officiant and for the great review. Natalia said… Choosing Jon as our officiant was one of the best decisions we made for our special day. He was very quick to respond to any concerns or questions I had planning our ceremony, very easy to work with, very professional, and just more than I can ask for. Having that precious memory of our special day definitely wouldn’t be the same if it wasn’t for Jon being there. If you are in search of a perfect officiant, look no further! Jon is it! Thank you so much for the great review, Natalia. I’m so glad to have been able to be your officiant! We hired Rev Jon for a small intimate wedding with just us and our kids in attendance. 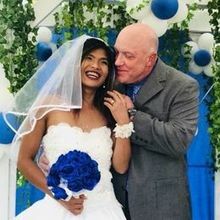 And he was exactly what we were looking for: He was great during the ceremony, professional and easy to get a hold of, he was accommodating with our desires for our ceremony, and he helped make it a lovely affair. Thank you, Rev Jon!! Thank you so much, Bob and Leslie, for the great review. I’m so glad you are happy with my services. Reverend Jon married us almost six months ago (08.11.18). He was very professional, he responded to us very quickly and we loved the scripture he wrote for us. We had a great experience with our first choice officiant, I would highly recommend Reverend Jon. Thank you for the review, Amy. And thanks for having me as your officiant! It was my pleasure to marry you and Charles. Natalia Land recommends Reverend Jon Turino, Minister, ULC Monastery, Wedding Officiant. 2-5-2019 on Facebook. Your reply: You are very welcome! And thanks so much for the great review. Thank you so much for the wonderful review, Sarah. I wish you and Bill a lifetime of love and happiness. Jon was wonderful! Our wedding was a bit more unconventional with us including our three dogs in our ceremony. Jon totally accommodated us! Even when our dog Charlie ran between Jon and us he was so polite. I felt so bad. Thank you, Jon, for marrying us and thank you for being so wonderful to us on our special day! It was my pleasure, Kristin. And thanks for the photos and the great review. Jon officiated our wedding and did a great job! Our wedding was intimate with only our closest friends and family, so it was important to us to have someone who had an understanding of the atmosphere we wanted to create for our special day. Jon was easy to work with, responsive, and made things easy. Highly recommend! Thank you, Faith. Marrying you and Dorrien was my pleasure. Rev. Jon is amazing- Relaxed, on time, professional, personal, and a real sweetheart! He made our wedding experience fantastic! Thank you so much for the great review, Sarah. It was my pleasure. I was a very nervous bride standing in front of everyone and forgot which hand was my left and even started giggling during the ceremony, but Jon was patient and very professional as I worked my way through. Thank you, Jon, you are worth every penny! Thanks so much, Tanya. I enjoyed meeting — and marrying — you and Jeffrey. 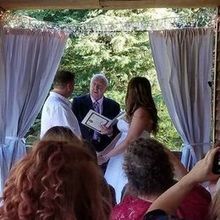 He was an amazing officiant and even bared with me when I got nervous and started giggling and just couldn’t remember what hand was my left!  I would strongly recommend him for anyone looking for an officiant. Very professional and very kind man. 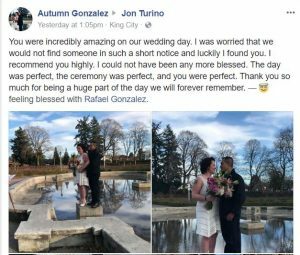 Wedding Officiant Jon Turino commented. Thank you for the great review, Tanya. You were fun! We had a great experience with Jon Turino. He was very nice and performed a beautiful wedding service for us. Our guests commented many times that they loved the scriptures he included and the nice things he said throughout the service. My three-year-old was being very silly the whole ceremony and kept picking up dropped flowers and insisted on standing with her Daddy and I during the ceremony and Jon just smiled at her and went with the flow of things. I definitely recommend him to anyone. He is amazing. Thank you so much for the great review, Kylie. I’m glad that you were pleased. And your 3-year old was a cutie! Jon was a pleasure to work with! He answered all my many questions, gave guidance for the processional, our vows and our ceremony script. He was even awesome about accommodating some last minute changes which made the days leading up to the wedding so much easier for us. The day of, he arrived early and the ceremony went off without a hitch! We are so happy that we picked him to officiate our big day! Thank you so much for the great review, Chantal. It was my pleasure to be of service and I’m grateful that you found it to your liking. Jon communicated very well with our needs and would respond back right away. He’s easy to work with and is open to people’s wants and needs. He can either chat with you over the phone or meet in person. His prices are very reasonable as well. If you’re looking for an officiant, I recommend Jon. Thank you, Melissa, for the very nice review. It was my pleasure officiating for you and Kirk at Gray Gables Estate. Thank you so much! It was a great experience. Jon was absolutely the perfect officiant for our perfect day. We can’t imagine what it would have been like without him. From the start, he was so great about communication and answering all of our (many) questions. After we picked him, he was always available to answer any further questions that came up (ceremony, marriage license, etc.). As for the big day, he was everything we wanted and more. He worked with us on the service script, providing a fantastic blueprint, while being open to our suggestions and changes, while also beautifully reading some personal words we had written that we did not want to speak ourselves. As an aside, when my voice started to crack from emotion while reading our vows, Jon calmly and quietly whispered to me one word, “breathe.” I’ll never forget that. We received so many compliments from our guests about Jon. Thank you, Mr. Turino. Thank you so much for your repeated patronage and for the wonderful review. I wish you both a lifetime of happiness together. Jon was very responsive and he met us before the wedding to go through the process. Our wedding is in woods and requires hiking to get there, and Jon was very accommodating about that. Thanks Jon! You are most welcome. And thank you for the great review. Jon was a delight from the moment we met him. He was so easy to talk to and made us feel so comfortable about the process. During the ceremony both my husband and I were very nervous, Jon said, “it’s ok, take your time. Breath.”. That put us at ease immediately. 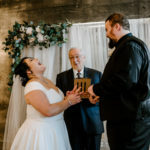 He has this calming way about him, and there were moments where my husband and I stumbled on a few words during our vows, but he allowed us to laugh it off and continue. Jon is very professional and attentive, we highly recommend him. Thank you Jon! I’m so glad I was able to make your ceremony a success for you. Thank you for the great review. Wow! Jon was amazing!! I recommend him 100%. He made our wedding day extra special. Jon always replied very quickly through the whole process, he was very very flexible with the many changes that came about with our wedding. Thank you Jon!!! Very reliable, professional, supportive. Wonderful to (work) with Jon, I would do it again! Thank you so much for the great review, Abi. It was my pleasure to be of service to you and Lupe. My experience with Jon was great. He was easy to get a hold of either on this website, email or by phone. I was very nervous at our first meeting because I didn’t have a lot of ideas of how I wanted my ceremony to go. He was able to quickly put me at ease with his years of experience, gentle demeanor, and sense of humor. We quickly had beginnings of my ceremony planned out. He was very open to any and all suggestions I had. The day of my outdoor wedding was well over 90°, but this didn’t seem to phase him. He officiated my beautiful wedding with great professionalism. I would highly recommend booking him for your wedding. You won’t be disappointed. Jon was absolutely fantastic beyond words!! I can’t tell you how many people came (and) told me how wonderful the ceremony was and how amazing our officiant was. He was a dream to work with, too! He responded so quickly and made it extremely easy to set up a meeting with, even though I put it off longer than I should have. He made it easy to customize the script and was extremely organized. He was very focused during the rehearsal and made sure that everything was ready. On the day, he made sure that everything was done correctly. He is worth his weight in gold, and there’s no one else I would ever want to work with more than him! Seriously, Jon Turino is THE BEST!! Thank you, Jon, for everything!! 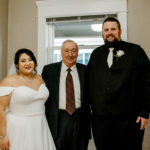 Not only were you super patient and easy going with us when I forgot the marriage certificate at home and had to have someone go get it but you handled the delay with total humor and complete understanding. The ceremony was all that we had hoped for and more. Thank you for making our day as memorable as possible. You are amazing!! Thank you, Lurdes. I’m so glad that you were pleased with my services. Jon was the perfect fit for our ceremony. He is kind, witty, and very professional. He also responded to every email within 24 hours. When my husband stumbled over this line, “wafflely wedding wife”, Jon quickly returned with, “want some syrup with that.” It was a hit and I’m so happy we chose him! Than you so much, Mary. It was my pleasure! Professional, responsive and flexible he is able to orchestrate order in all the chaos that is a wedding, not to mention that his fee is a great value. Thank you, Steve. Hope you and Ardie are doing great. Jon answered all our questions and work with us every step of the way. He did an amazing job with our ceremony and couldn’t be happier!! Thank you, McKenzie. It was my pleasure to be of service to you and Jeffery. Jon was such a pleasure to work with as our officiant for our wedding. We recently got married in May, but I choose Jon months in advance. He answered all my questions in a timely manner and was flexible with all the changes we made. He performed a beautiful ceremony! Thank you so much for the very nice review, Amelia. It was my pleasure to be of service to you and Jose. Jon was amazing to work, he knows exactly what to do and just guides you though it all, we hired him in a very short notice situation and he was great!! Thank you, Jon, for an amazing ceremony!! The family and I loved it! Thank you for the review, Trina. It was my pleasure to be of service to you! Jon was a joy to work with. We basically had an elopement at our home. It was very informal and Jon didn’t treat it any differently than if it had been a big affair. He helped us create a memorable service that our few guests really enjoyed. Thank you so much! Thank you, Marlys. I’m happy that you were pleased! We had a great experience hiring Jon! I initially chose him because he seemed unbiased that our wedding was an elopement. He was very helpful and caring in making sure the verbiage was just right. He responded quickly with all emails, came early, and was very professional. During the ceremony, he spoke loud and clear. He was very genuine in wishing us all the best. I would highly recommend Jon to officiate your special day! Thank you, Lauren, for the great review. Marrying you and Tyler was my pleasure and I wish you both a lifetime of happiness together. 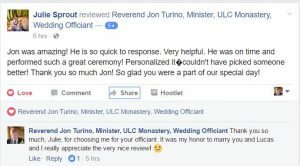 Reverend Turino was the perfect choice for our special day. Would highly recommend him, couldn’t be happier. Thank you, Lon. It was my pleasure to marry you and Gina! We (had) a very small but happy wedding. Jon was prompt and professional. We had a very nice service. I would highly recommend Jon for any couple! Thank you, Dawn. It was my pleasure to be your officiant! Jon was such a great officiant for us, he helped calm wedding nerves and ease our minds. Everyone was very impressed and I will definitely be recommending him to friends and family. Thank you, Savannah, for the wonderful review. I appreciate it very much. Thanks for selecting me as your officiant. It was my pleasure to marry you and Sam. I would highly recommend Jon! He was just what we were looking for at a very reasonable price. I wanted a very simple wedding and he helped accomplish that. He was amiable, professional, helpful, and willing to give advice. And he looked great in pictures! 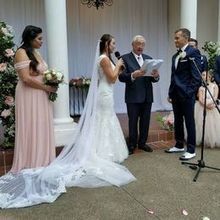 I personally liked having a man do the ceremony, it felt more traditional. He helped complete our perfect day!! And I was able to book him last minute! Thanks so much, Tara, for the excellent review. It was my pleasure to officiate for you and Victor. John exceeded my expectations in every way. Having never arranged a wedding, we had no idea what to expect or even what to ask; John anticipated that and came to our meeting with samples, options, and answers. He was kind, knowledgeable, and a consummate professional. I highly recommend this guy to officiate your wedding. Thank you very much, Scott, for the great review. I appreciate it. And the chance to meet and marry you and Cheri. Jon was amazing, he made us feel very comfortable and kept us calm when we got nervous, he went over everything with us and was willing to change things if we wanted them changed. He worked with us making sure everything was all set and ready to go, he even joked with us, which I loved! Have this man marry you, you won’t regret it! Thank you so much, Catherine. Your review reminds me why I love my clients! If you pick Jon, you’re gonna get everything you hoped for at your wedding, he is absolutely 100 percent amazing, we loved him and the wedding was amazing with him by our sides! Pick him! Thank you so much for the fine review, Catherine. Marrying you and Tim was my pleasure. Jon responded to me right away for a short notice wedding. He spoke with me on the phone regarding the details. He was very nice, showed up to our wedding early, and made the whole process a breeze. Would hire him again! Thank you for the very nice review, Melissa. Marrying you and Fareed was my pleasure. Jon did a wonderful job at our wedding! He was super responsive leading up to the wedding, he as informational, and he was nice. He was professional, yet personable the day off our wedding and was very easy going! Thanks!! Thank you, Chayla, for the great review. It was my pleasure to be your officiant and I’m glad you liked my services! We can’t speak highly enough of Jon! From the first time we reached out to him until the last moments before the wedding, he remained incredibly responsive and reassuring that our special day would turn out exactly as we wanted it. 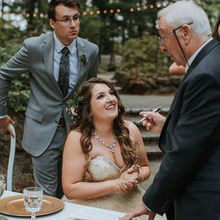 With Jon, you will never feel unprepared during the ceremony; he will guide you, step-by-step, through the entire process by gently directing you and feeding you your words (you have no idea how helpful this is when you’re overcome with emotion). One of the best things about Jon is he is as much an observer of the wedding as he is the minister – he will be just as happy to be there as your guests. Truly, having Jon as your minister will feel like you asked a close friend to officiate your wedding. Jon was by far the best choice for us, and we feel you can do no better! Thank you so much for the glowing review, Andrew. It was my pleasure to marry you and your beautiful bride Bianca in that lovely setting. Jon was amazing to work with. 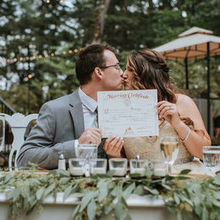 My husband and I got married at a brand new venue in Portland at a vineyard and we couldn’t have asked for a better person to marry us. He was prompt at responding, was very friendly and walked us through the steps we needed to take for our wedding. Jon delivered a beautiful script and we truly appreciate his genuine nature. We got married at the end of July and moved to Texas immediately after, delaying our review for him, but in no way could we ever forget his service. Thank you Jon, we would hire you again if we could! Thank you, Brittany! It was my pleasure to marry you and Kevin. We had chosen Jon as an officiant for our wedding, and it was one of the best decision we’ve ever made. He was kind and patient with all of our last minute wedding planning. From the moment we contacted him, he promptly replied to every email, messages, and phone calls. Wedding planning was stressful enough, but Jon surely made it a whole lot easier. He went above and beyond to make sure that our wedding ran smoothly. He is reliable, dependable, and accommodating. Our ceremony couldn’t have been any better and it was everything I’d ever hoped and wish for…..many thanks to Jon. We’ll forever recommend Jon to our friends, family, and future brides! If you’re looking for an officiant, look no further!!! Thank you so much, Mai, for the fine review of my services for you. I’m glad you are pleased and I wish you and Gabriel many, many years of happiness together! Jon was SO INCREDIBLE! We absolutely loved having him as our officiant. So easy to communicate and get along with, he captured our vision and worked with our needs and desires. He sent us a script of our wedding a couple weeks in advance in case we wanted to change or add anything, it was so helpful. WOULD RECOMMEND TO ALL COUPLES GETTING MARRIED!!! Reverend Jon was wonderful to work with. 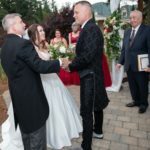 We had a unique ceremony that blended both my Ukrainian culture and my husband’s American culture and Reverend Jon wrote a script that combined the two cultures perfectly. He was genuine and sincere and addressed any questions immediately. He also provided some great insight on the best way to say our vows and even how to stand in order to get the best pictures. It was a stress-free ceremony knowing that Reverend Jon was our Officiant and he truly helped make it perfect. I would recommend him in a heartbeat. Thank you so much, Alena, for giving me the privilege of marrying you and Matthew. He was very nice and professional amid my before wedding chaos. 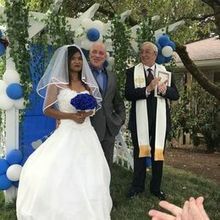 Everyone said it was a really wonderful wedding ceremony. Would hire him again. Thank you, Mr. Turino. Thank you, Rachael, for selecting me as your officiant! Jon did a wonderful job officiating my husband’s and my wedding. He talked to both Andy and I before the wedding as well as emailing us the ceremony script to make sure everything was to our satisfaction. He was wonderful! Thank you, Christie, for selecting me as your officiant. Glad everything went the way you wanted it! Andy and I feel very blessed that we chose Jon to be our officiant. He was very professional and really wanted to make sure that Andy and I had the ceremony that we always dreamed about. He also did the wedding rehearsal for us and helped make sure the ceremony went perfectly. He helped make our day wonderful! Jon puts the clients’ wishes first, and he is very responsive, gracious, and accommodating. Highly recommended. Thank you, David, for the excellent review. I’m glad I was able to make your ceremony with Kathlene a success. Jon was very accommodating and professional. He adjusted to our particular wishes for our ceremony and was kind and gracious from the start of our interactions to the finish of our wedding day. Highly recommended! Jon did great for our ceremony! He responded quickly when I was inquiring and very communicative through out the process. He showed up to my venue right on time and did a great job! Thank you, sir, for helping make my special day so amazing! Thanks, Melissa, for the great review. I enjoyed marrying you and Nick. Jon thank you so much for making our day just how we wanted it to be. Loved our ceremony and you were the perfect fit. My friends and family loved it. Thank you very much, Audrey. 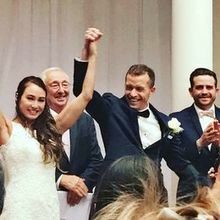 It was my pleasure marrying you and Billy! I’m so glad that we found Jon. I was getting stressed as our wedding was approaching and my officiant decided to back out. I found him through a wedding site I was following and he was available and reached out to help us with our big day. We talked on the phone about our wishes and plans for the ceremony. He emailed us with information right away and had vows ready for us to practice. We met in person and our personalities just fit and knew he would be perfect for what we wanted. My stress and fear melted away as we got to know him better. The ceremony was exactly what we wanted, fit our theme and wishes and really enjoyed being part of our family on that big day. Thank you, Jon, for helping our day be relaxed and our ceremony got great reviews by family and friends. Jon was fantastic to work with. He was exceptionally professional and attentive to our needs. We would highly recommend him to all couples looking for someone to make their wedding day something to remember. Thank you for the great review, Cory. I very much enjoyed marrying you and your lovely bride, Christina. Not only did Jon officiate our wedding, but he organized our bridal party as well. He showed up on time at every meeting we scheduled. He is professional, but what really got us was his voice. Perfect for our wedding and just what we were looking for. The only downside I can think of is that he didn’t stay to feast with us. Thank you again, Jon. Thank you, Keena, for the great review. It was my pleasure working with you and “the gang.” Sorry I couldn’t stay for the feast. It looked like it was going to be great! Jon Turino was an absolutely wonderful officiant! We couldn’t have asked for more beautiful wedding ceremony. He stayed in touch with us leading up to the wedding, and ensured that our ceremony was exactly how we wanted it. 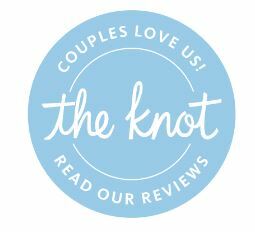 We would highly recommend him to anyone, as we couldn’t have asked for a better officiant! Thank you, Tessra, for selecting me as your officiant. It was my pleasure to marry you and Omero today. And thank you so much for the very nice review. I do appreciate it. 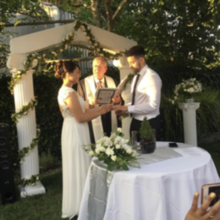 Jon Turino was definitely a great choice as our wedding officiant! He was a great communicator and was always quick with replying to emails. He was very open to any ideas or changes that we wanted to make and also gave us some good ideas. He showed up early, was prepared and very professional throughout the whole ceremony! Thank you so much, Viktoriya, for the very nice review. It was my honor to marry you and Marcus. Jon is one of the most professional and personable men that we’ve met. He went to lunch with us to hear what are ideas were, and to teach us what some of the traditions were that we really wanted to know! He kept in touch with us and was open to everything we wanted to do, even if it was last minute. Thank you so much, Jon for helping us make our special day come true! We couldn’t have asked a better officiant to marry us. Thank you, Elise, for the wonderful review. I’m glad I could make your ceremony with Jacob just the way you wanted it. Thank you for the nice review, Kerry. I’m so glad that you and your family were pleased with the ceremony! We were so pleased with Reverend Turino at every step of the way. He was quick to respond to us when emailing. He was very professional and friendly. He made us both feel confident and prepared. His rates were very reasonable and he was flexible with options – he never felt pushy. Our wedding went very smoothly and a large part of that was thanks to him! Thank you, Reverend Turino!! Thank you so much, Rebecca, for the kind words. And thanks for selecting me as your officiant. I loved marrying you and Raul. Reverend Turino was a divine choice. 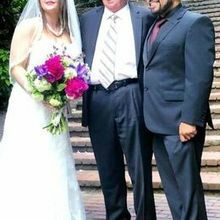 He arrived early, was kind open and respectful, and takes care of submitting all the paperwork required after the ceremony by the state of Oregon. Great communication before and after. Thank you, Reverend Turino! Thank you, Lindsay, for the very nice review. It was my pleasure to officiate your ceremony. Jon was super helpful and kind. We have never planned a wedding or been in one and didn’t know what we were doing. He gave us pointers before the rehearsal and lead the rehearsal. Which was really helpful and helped ease our nerves. Jon was easy going and still very professional. Finding an officiant was something we left for last and luckily Jon was able to squeeze us just a month before the wedding. Lucky for us we got married in the down season. I suggest booking him a lot earlier than we did to make sure you’re in the right hands. We definitely picked the right officiant for the job. Thank you, Joycelle, for the very nice review. I loved marrying you and Margarito! Thank you, folks. It was my pleasure! Thanks for the fine review, Dana. Glad you liked the service. Thank you, Scarlet. It was my pleasure to be the officiant at your vow renewal ceremony. Jon did a fantastic job at our ceremony! We had a lot of ideas but weren’t really sure how to bring it all together. He helped us understand what would work well and what we might want to change. However, he let it be our ceremony, so we were the final deciders. Jon was extremely flexible and very responsive usually responding to emails and calls within hours. Despite booking him only a few weeks before the ceremony, Jon was able to streamline all our wishes and provide us with the most sentimental, loving, and “us” ceremony possible. We would highly recommend Jon to any and all couples. 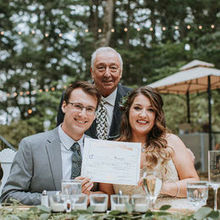 I was the wedding coordinator for a recent wedding and I am so happy the couple chose Jon! He was extremely responsive, on time, and was great in guiding the couple through the process of writing their vows. He was also very helpful and flexible with getting the marriage license signed, he stayed around the reception while we finished pictures and was so gracious! Thank you, Melissa, for the very nice review. I appreciate it very much and I look forward to working with you again. You did a great job of coordinating and managing a pretty good sized bridal party and event! Jon was a great resource and I would highly recommend his services. Answered all our questions and his response was quick. Jon was a joy to work with! Thank you so much, Richard. I really enjoyed working with you and your lovely bride Katie. Thanks for the nice review, Samantha. So sorry about the mispronunciation. I should have double-checked with Justin. Thanks for that feedback. It was an amazing wedding. I was 20 minutes late and according to my new husband Jon was patient and kept a positive attitude. I will recommend Jon to officiate any wedding.